The Lamellar Filter is an Automatic Mechanical Cleaning System especially designed for the filtration of heavy fluids as Heavy fuel oil, heavy crudes and processing residues in general, typically with high solid content. The filter is made by filtering elements assembled in filtering packs. A single filtering element consists of a stack of calibrated metal disks, which at their top are connected to an electric motor that rotates the disks during the automatic mechanical cleaning. The cleaning step is performed simultaneously with the filtration phase without interrupting the feed flow. Filtrex lamellar filter technology allows to completely eliminate the wash oil consumption using an automatic mechanical cleaning of the filtering elements. The filter is designed for the required mechanical strength by assembling rotating filtration disks in filtering elements. 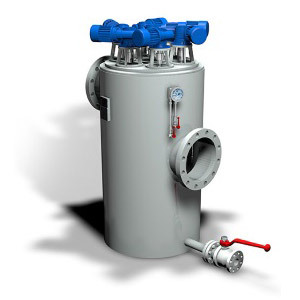 This drastically reduces the plot area requirement and the operating and maintenance costs by minimizing moving parts like valves, and by eliminating the consumption of wash oil. It is designed to operate at low pressure drop, normally 0.5 bar while the competition operates normally at 1.0-1.5 bar. Low pressure drop avoids high velocities which cause the agglomeration of contaminants like asphaltenes which in turn cause permanent blockage of the filter free area.